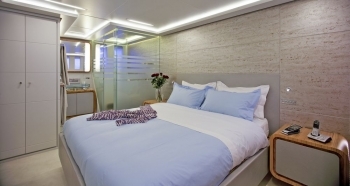 Main Deck, Full Beam Master with King + Lower Deck Full Beam VIP Master King + 2 Guest Queen Cabins + 2 Guest Twin Cabins, each with Pullman, and each cabin has a private bathroom with color therapy. 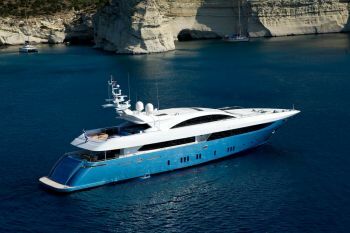 The 137′ Mondomarine (France) motor yacht BARENTS SEA is one of the largest Greek yachts based in Athens, and she is one of the few with a skylounge and a Jacuzzi. 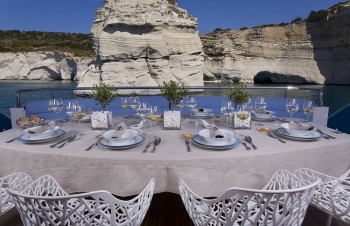 As well, she has six staterooms for guests, and a five star chef, Panagiotis Palatos, aboard many years, who is an extremely talented Western-style chef… As each course is served, Panagiotis appears at the dining table and gives a short introduction about where the ingredients come from in each dish. 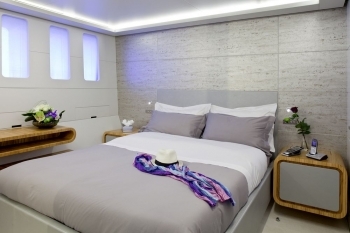 Chief Stewardess Jenny Papadopoulos’s hospitality and communication skills are second to none. Second stewardess Maria Kinalopoulou is a successful stewardess and a massage therapist. 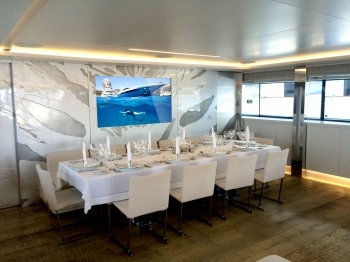 Steward deckhand Marlan is friendly and handy to assist; he enjoys watersports; the yacht carries two tenders, two seadoos, one waverunner, three seabobs, a flyboard – and all manner of ski and float toys – as well as an extensive amount of exercise equipment…. 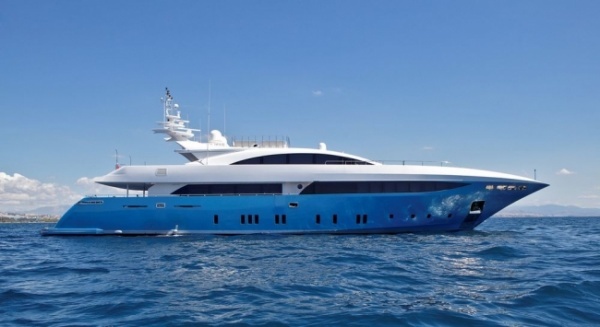 Amenities and water toys are abundant aboard BARENTS SEA…. 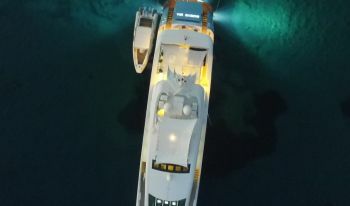 Captain Panagiotis Ntakos grew up in Elefsis; he’s an outdoorsman; a graduate of the Greek Merchant Marine in 2002, he is trained as an engineer and navigator; he loves sailing, and yacht racing, in particular. 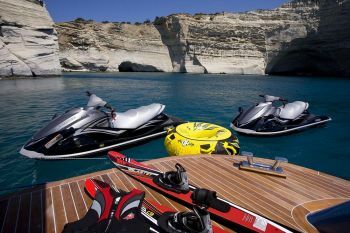 Chief Officer Stefanos Magiatis is a personal water craft instructor. There are eight in the crew total. 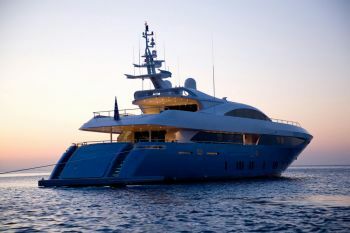 A two-story yacht, not including the accommodation deck, BARENT SEA has no deck above the skylounge; the Jacuzzi is located on the aft deck of the Upper Deck, on which the skylounge is located, and it’s made of beautiful mosaic tile. 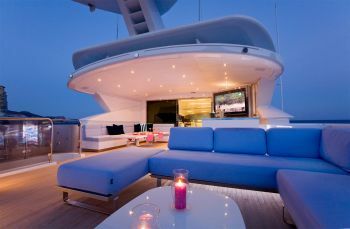 In fact, the furniture is quite minimalist on BARENTS SEA; the ottomans in the skylounge are low and designed as recliners, rather than chairs… on which to sit recline and watch television….ideal for young people. 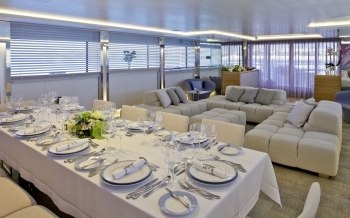 Group seating is more comfortable on the upper aft deck, where there is a large array of modern wicker furniture with outdoor cushions and all manner of coffee tables. It’s stunning. 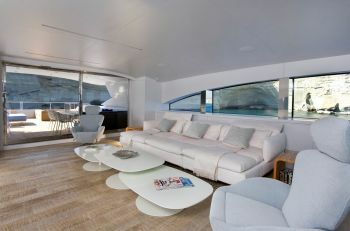 Five guest cabins are located on the accommodation deck; the master cabin is located forward on the main deck. 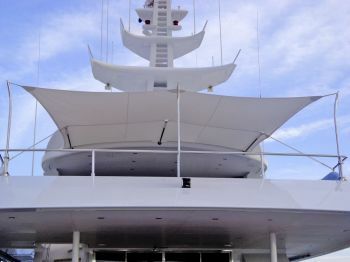 Two staterooms are the full beam of the boat. 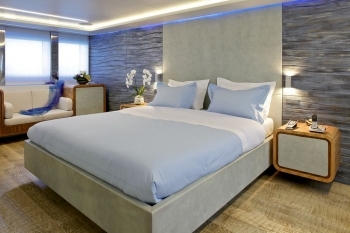 Four staterooms have double beds; two staterooms are Twins. 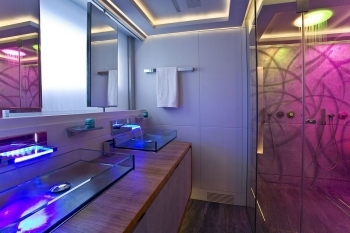 Each guest bathroom has light therapy in colors of pink and blue. BARENTS SEA is the total package. 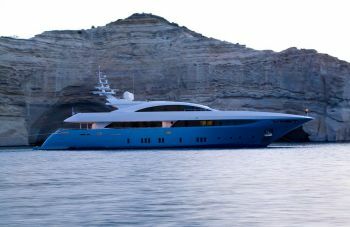 She has been chartering in Greece for years, and is well-established. 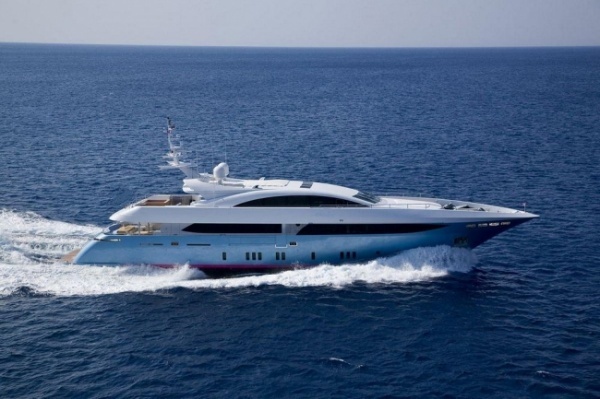 With same captain and crew aboard for many years, they are all fluent in English and charming. Hot dry winds tumble down the mountains from the Northeast and blow in a driving force across the Aegean to the Southwest. Citrus, olive, bouganvilia trees thrive on the barren landscape. Spend hours, swimming in warm crystal clear turquoise waters. 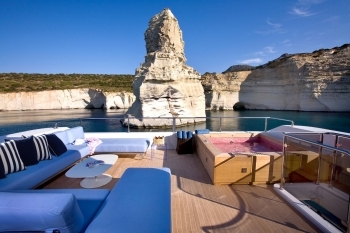 Greece has an amazing climate and many quaint ports and islands to explore.